Bonus - In addition to the above prize money, all runners finishing the half marathon faster than the current course record (1:08:41 for men, 1:24:17 for women) will receive $250. All Half Marathon and 5K finishers will receive a finisher's medal. All children will receive a prize for participating in the Kids' Fun Run. Anyone can participate! Runners and walkers of all ages (and speeds) are eligible! Strollers are welcome on the 5K. 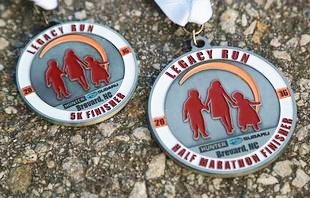 You can also participate, and earn money, by referring new runners and/or walkers to the Legacy Run. All first-time Legacy Run registrations that include your unique referral code will generate 10% of the registration value for you. Your referral earnings will accumulate through race day and will be paid out within two weeks after the event. This opportunity is available whether or not you run/walk in the Legacy Run. 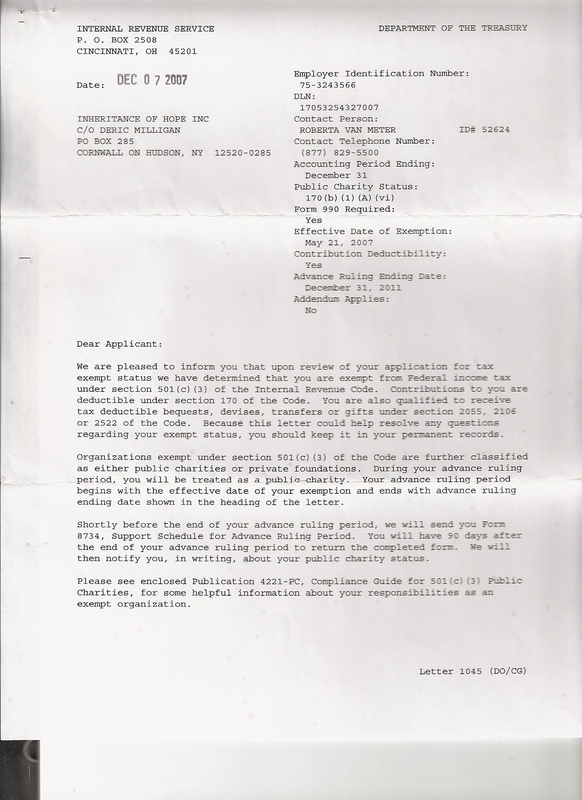 To get your unique referral code, email aaron@InheritanceOfHope.org. 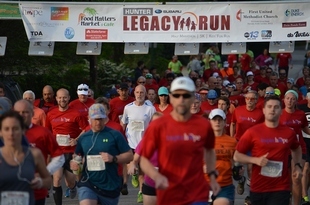 Fundraising is completely optional for the Legacy Run, but it does increase the event's impact. If you're interested, you can easily create a personal fundraising page. All gifts made toward your page are tax-deductible donations to Inheritance of Hope, a 501(c)(3) tax-exempt charity. Since all proceeds will benefit the young families facing the loss of a terminally ill parent that Inheritance of Hope serves, we encourage you to help us inspire hope! This handy fundraising guide will help you make the most of your personalized, mobile-friendly page. Even if you don't want to run or walk at all, you can register for a free fundraising page and help build lasting legacies! 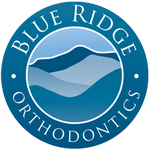 Both courses will start and finish near 123 East Main Street, Brevard, North Carolina. The Half Marathon course provides scenic views of the beautiful western NC mountains as the course winds through the Transylvania County countryside before returning to the city limits. The 5K course provides a mix of hills and flat terrain allowing participants to experience the city of Brevard. The Half Marathon course is USATF Certificate #NC16008DF. The 5K course is USATF Certificate #NC16006DF. There are six water stations on the half marathon course and bottled water waiting for every finisher as well. The water stations will be set up at approximately 2.5 miles, 4.5 miles, 7 miles, 9 miles, 10 miles, and 11.5 miles. Oranges, Gatorade, and water will be available at every station. Gu gel will be available at 4.5 and 9 miles, and port-a-johns will be near those stations as well. 5k participants will also use the last water station, which is located slightly over 2 miles into the 5k. For your safety, please remain in the right lane for the duration of the course. Do not switch lanes or run/walk in the middle of the road. PLEASE use caution and be alert for traffic. If you need medical assistance while on the course, reach out to one of our many course volunteers or water station attendants to reach the EMS crew that will be assisting us. If you are at the main event area, a first aid station will be located at the volunteer tent, which will be to the left of the Water Oaks building (when you are facing it from the street). To receive instant notifications of your times (split time for Half Marathon and finish times for 5K and Half Marathon), sign up with ChronoTrack and enter your mobile number. You can also add numbers of friends and family members and link the race to your Facebook and Twitter accounts if you would like your times automatically posted online. Photographers from Sassy Shots and Jordan Lance Photography are coming out to help record milestones and memories. Watch for them as you finish and be sure to grab your friends and family and pose for a picture at our photo spot by the finish line before or after you run. Photos will be available for free download from Flickr soon after the race. A link will be emailed to each participant. Brevard is a wonderful community with much culture and natural beauty to experience. If you are traveling from out of town, we encourage you to make a weekend out of it and enjoy all that Brevard and Transylvania County have to offer! Come to run and stay to experience one of the 250 waterfalls and 100,000 acres of land laced with epic hiking, mountain biking, trail running, and more. For more information, including lodging and dining deals, visit www.VisitWaterfalls.com. Click here to receive 25% off regular room rates at Brevard's Hampton Inn. From pre-race advertising, to course direction, and managing a water station, we need YOU to help make the Legacy Run a huge success, and we LOVE to take care of our volunteers! Interested? Click here to sign up! You can also contact Heather Crawford at Heather@InheritanceOfHope.org -- thanks! Click here to see our sponsorship benefits and levels. Click here to become a sponsor! Contact Heather Crawford at Heather@InheritanceOfHope.org for more information about sponsoring. 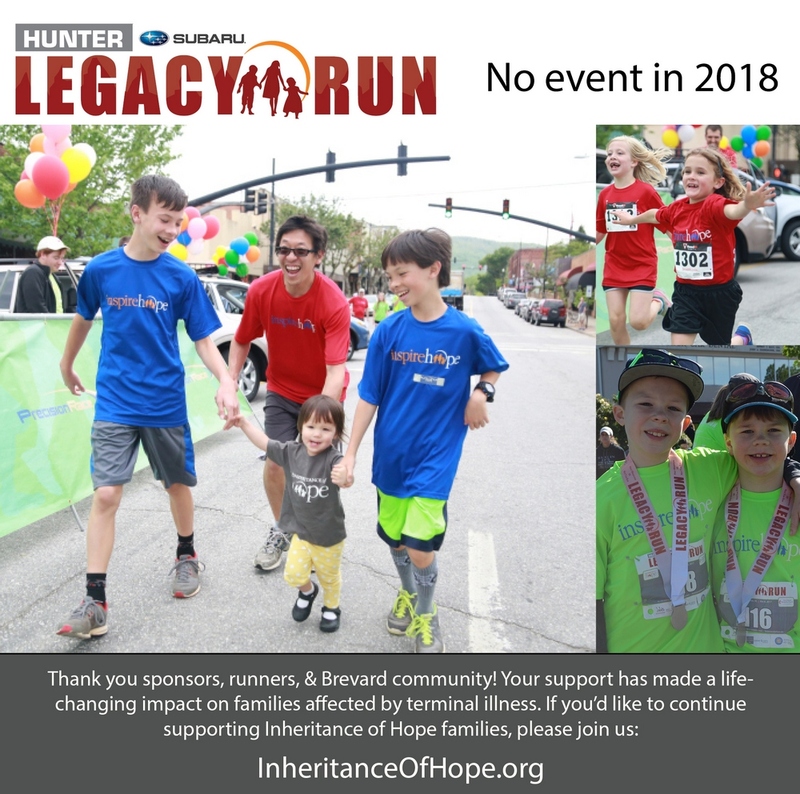 Since 2013, the family-friendly event serves as a fundraiser for Inheritance of Hope, a NC-based charity that serves families facing the loss of a parent due to terminal illness. Inheritance of Hope's signature offering is its Legacy Retreat®, an all-expenses-paid experience where families create lifelong memories and receive tools to navigate the challenges of terminal illness. To date, families from 39 states have attended the life-changing event. 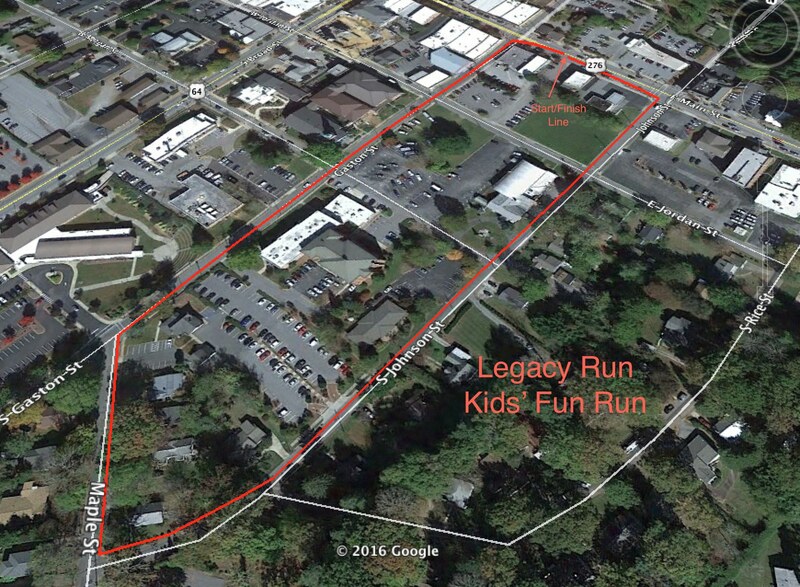 The Legacy Run will occur in the heart of Brevard, North Carolina, on May 6, 2017. 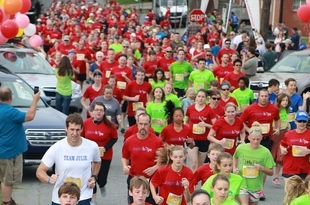 It features the second-ever Half Marathon in Brevard's beautiful mountain scenery! The Half Marathon features views of the Western NC mountains and the 5K course tours the "Heart of Brevard." Walkers, strollers, and pets are welcome in the 5K. Kicking off at 7:30am, participants will be led by the Hunter Subaru pace car. The Legacy Run will also feature pre- and post-race food provided by distinctive local restaurants and kids' activities. Sign up today to take advantage of online registration rates and be part of Brevard history! Bib pick-up is on Friday, May 5th, from 4-7pm at First United Methodist Church in Brevard. The address is 325 N Broad St, Brevard, NC 28712. You can park in front of the church and in College Plaza. Hunter Subaru vehicles will be in front of the entrance. Come by to get your race bib, tech racing shirt (guaranteed for all registrations through March 31st; first-come, first-served otherwise) and swag bag and to interact with Legacy Run staff and volunteers as you make final preparations for race day! You can also register for the Legacy Run at the bib pick-up. Thank you for a great 2017 Hunter Subaru Legacy Run! Race results, including finishing video clips, are available here. Want to fundraise for the cause? Click here to get started. Once you complete the simple setup of your personal fundraising page, this guide will help you make the most of it! Contact TeamIoH@InheritanceOfHope.org. Team Inheritance of Hope is here to support you every step of your journey!